Josh has 25 minutes left to live. Lying alone in a pool of blood, Josh has not much time to think. Yesterday he stabbed his best mate, and now it has happened to him. But there are questions he cannot get out of his head. Like, how did he get into this mess? Will anyone find him in time? Will his girlfriend forgive him, and what really happened to his older brother? As his life slips away, the events of the last 24 hours start to look very different. 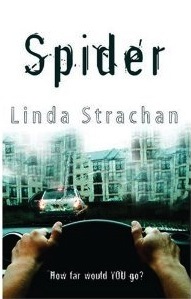 Categories: Crime, Scotland, Thriller | Tags: Linda Strachan | Permalink. 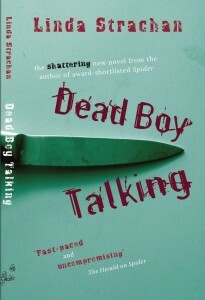 A hard-hitting, provocative novel about teenage love, loyalty and fast cars. Spider is an adrenaline-fuelled ride – a glimpse into a life spinning out of control. Spider is on his last warning. If he’s caught joyriding again he’ll be sent down, no questions asked. He’s trying to stick to the straight and narrow but his girlfriend Deanna and mate Andy reckon he should risk one last run.